Anchorage – The Legislative Affairs Agency announced an opening for the non-partisan role of Legal Services Director. Doug Gardner has worked as the Legal Services Director for the past eight legislative sessions, including multiple special sessions. 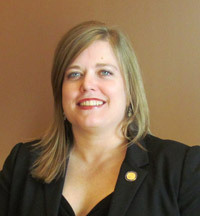 At the most recent Legislative Council Meeting, he announced he would be stepping down from the position. 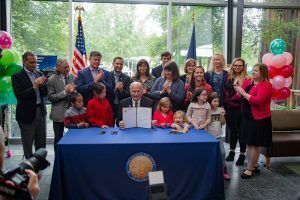 Anchorage – Today, Alaska Governor Bill Walker signed legislation sponsored by Representative Matt Claman (D-Anchorage) to improve laws controlling franchise agreements between auto dealers and manufacturers. House Bill 136 updates Alaska’s franchise statutes to improve protections for auto dealers, auto manufacturers, and Alaska consumers. 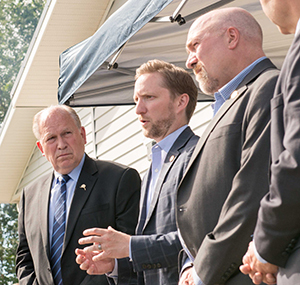 Anchorage – Today, Alaska Governor Bill Walker signed legislation sponsored by Representative Geran Tarr (D-Anchorage) to improve how law enforcement agencies address and solve sexual assault cases. House Bill 31 requires an annual audit of untested sexual assault kits and implements a victim-centered approach to reporting sexual assault. The bill also requires 12 hours of sexual assault training for new police officers. 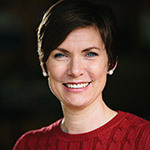 Anchorage – On Friday, officials from the administration of Alaska Governor Bill Walker, health-policy advocate Dr. Alan Gross, and several patient-advocates joined Representative Ivy Spohnholz (D-Anchorage) at the Anchorage Neighborhood Health Center to highlight the importance of preserving protections for patients with pre-existing conditions.